Are you always tired? Do you crave carbohydrate foods like soda, macaroni and cheese, candy, sugar, sweets? Do you have high blood pressure, high cholesterol, and high blood sugar? Do family members have diabetes? Does it seem like you can’t lose weight and are getting heavier and sicker? The above symptoms are common in people with the genetic profile for metabolic syndrome or Metabolism B. 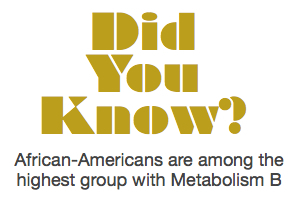 Over 100 million people in the US have Metabolism B and African-Americans are among the highest groups to have this uncontrolled syndrome. Met B includes a combination of being overweight, and having high cholesterol, high blood pressure, and high blood sugar. The traditional recommended diet of low calories, salt, fat, and sugar does not stop the progression of Met B. Over time, despite all the efforts of the dieters, they get fatter and sicker, require more medication and develop more health issues. Over 55% of people who struggle with weight have Met B. Although Met B was discovered in the 1950’s, it wasn’t until recently that a major cause was identified, and it is in your genes! The excess fat on your body and in your blood may be triggered by the excess production of the fat gain hormone, insulin! People with uncontrolled Met B respond to normal rises in their blood sugar with excess amounts of the hormone that makes them fatter on the inside (blood fat) and the outside (body fat). Eventually, the organ that makes insulin — the pancreas — fatigues from overwork, which leads to higher blood sugar and eventually … to type 2 diabetes. To illustrate this point, let’s use the example of two friends eating French fries. One of the friends, Aliyah, has normal metabolism (she will release the right amount of insulin to match the blood sugar rise from the carbs in the fries) and the other, Keisha, has uncontrolled Met B (she will release excess insulin to match the blood sugar rise from the carbs in the fries). When Aliyah eats the fries, her blood sugar rises, her pancreas releases the exact right amount of insulin. Insulin opens the right number of cells to allow the sugar from the fries to enter her cells (she is fed) and her blood sugar returns to normal. Aliyah has lots of energy, feels full, and doesn’t even get hungry for about 4-5 hours. Aliyah, AND her blood sugar is left lower. After eating, Keisha is tired, feels hungry, and is looking for more to eat because her blood sugar was left low! After years of her pancreas over-responding with excess insulin, Keisha’s pancreas will gradually tire, burn out, as she becomes overweight/obese and eventually develops type 2 diabetes. Aliyah will never develop type 2 diabetes because she doesn’t have the genes that could trigger it. The type of diet that will help Keisha has 2 steps: 8 weeks of a lower carb diet that will allow the pancreas to take a much needed rest. During this time, she will quickly feel energy and lose weight and fat. After 8 weeks of rest, carbohydrate foods return in a very systematic way (the right type, the right amount, the right timing). When Keisha gets to the weight she wants to maintain (she looks great, her health has improved, and medications are reduced) she will follow a lifestyle (not a diet) that maintains her hormonal balance. If you are interested in learning more about Metabolism B, how to know if you have it, and the diet and lifestyle to control it….read more on http://www.themetabolismmiracle.com. This entry was posted in Uncategorized and tagged ADD/ADHD, african america, Alzheimer’s disease, atkins, belly fat, black, BMI, breast cancer, breast cancer awareness, cholesterol, chronic fatigue syndrome, diabetes, Diane Kress, diet, Dr. Oz, Dr. Phil, Ellen, fibromyalgia, glucose, glycemic index, high glycemic index, hyperlipidemia, hypertension, hypoglycemia, insulin, insulin resistance, keisha, Met B, metabolic syndrome, Metabolism B, Metabolism Miracle, Metabolism Miracle Cookbook, midline adiposity, oprah, PCOS, prediabetes, south beach, The Doctors, type 2 diabetes, weight loss, weight reduction. Bookmark the permalink.